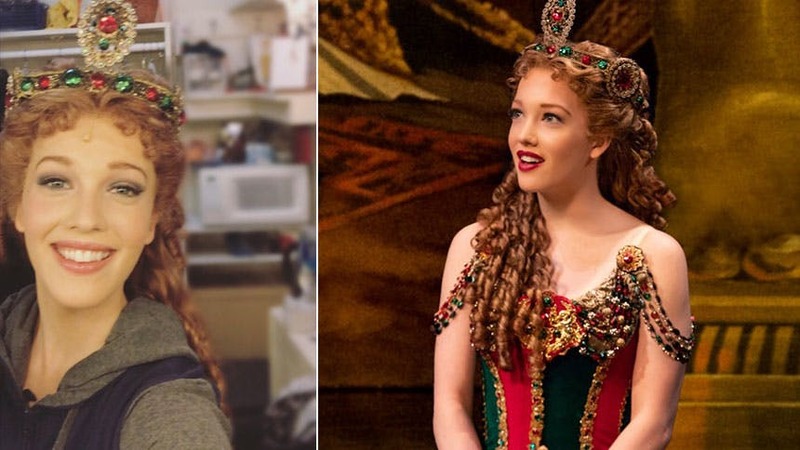 Kelsey Connolly makes her Broadway debut as Meg Giry, the plucky, young ballerina at the Paris Opera and Christine Daaé's bestie, in the historic production of The Phantom of the Opera. BroadwayBox caught up with the talented, young Juilliard grad to talk about joining Phantom, bringing a fiery, playfulness to Meg, and her foodie hobby. 1. What was your reaction when you found out you’d make your Broadway debut as Meg in Phantom? I was so shocked! I never imagined I would make my debut as a principal on Broadway! In that moment, I knew that my life had unequivocally changed forever. 2. What do you love about the role of Meg? I love so many things about playing this character! I love Meg’s tenaciousness. She never gives up in her pursuit of the truth. Meg is fiery and outspoken, and stands up for who and what she believes in—whether that is shedding light on her friend Christine’s talent or substantiating the existence of the Phantom. 3. What did you hope to bring to her? As I would hope for with any new role, I wanted to bring a fresh perspective and interpretation. I like to find a good mixture of playfulness and steadfastness with Meg. She exhibits youthful qualities but is by no means naïve. Within the framework of my role, I try to find moments throughout the show to establish that dichotomy. 4. Who was the dancer you admired most growing up? I admire many different types of dancers and performers, for many different reasons, so it’s hard to choose just one! I remember seeing Danny Tidwell on the early days of So You Think You Can Dance and falling completely in love with his dancing and his ability to adapt to all styles. He could perform a classical ballet variation from Le Corsaire then do a funky hip hop dance—truly versatile and an inspiration to me as a young dancer. 5. What did you do to celebrate or commemorate the night you made your Broadway debut? My Broadway debut within itself was a commemoration of the years of hard work, sacrifice, and dedication by both my family and me. Having them there that night to see my dream realized was all I could have ever hoped for, and in particular, having both sets of grandparents in the audience that night, was something very special, and a memory I will cherish forever. 6. What was the craziest part of a performing a Christmas season in the Radio City Christmas Spectacular? I would have to say one of the craziest parts was the number of shows we did in such a short period of time. The show is split between two casts and in less than two months each cast performs approximately 100 shows, which equates to 2-4 shows a day. Talk about stamina! Another “crazy” aspect is that my cast did the morning shows, sometimes beginning at 9 AM! There were many mornings when I would walk to the theater and experience the rarity of quiet New York City streets. 7. What’s your favorite Juilliard memory? Out of the plethora of wonderful memories at Juilliard, one of my favorites was dancing with my entire class for our senior showcase bow. It was a theater-esque piece choreographed by Andy Blankenbuehler, personifying the emotional journey we went through together over the course of four years. It was such a fun dance to perform and an incredibly bittersweet moment, as it was likely the last time all 27 of us would share a stage. 8. You also enjoy choreographing. If you could reimagine any musical, which would you like to choreograph? I would love to choreograph any Sondheim musical. While he is certainly classic Broadway, there is an intriguing darkness to Sondheim’s music, paired with gorgeous sweeping melodies, all of which would be well supported by dance. I’m imagining some off-kilter contemporary ballet for Sweeney Todd. 9. What’s one thing you feel passionate about outside of dance and performing? I am a big foodie! I love the New York City food and restaurant scene—there is always somewhere new to go or something new to try. I also love to cook. As a dancer and Broadway performer, I need to have as healthy a diet as possible, so I love finding ways to put a healthier spin on typically indulgent dishes. 10. Tell us a memorable audition story. There are so many! But I’ll share the one that led to my acceptance to The Juilliard School. I didn’t initially get into Juilliard, so I attended the University of Michigan for a year before I ended up transferring. I choreographed my own solo for the audition and I spent nights in the studio, after classes and rehearsals, to develop movement that would best showcase my abilities. I flew to San Francisco where Juilliard was holding one of their college tour auditions, as it coincided with my spring break. After ballet class, there was a cut and it was time to perform my solo for the dance director and respective faculty. I made it through the next two rounds, culminating in an interview by the associate director, who is one of my biggest mentors to this day. I didn’t know it at the time, but I also met four of my future classmates. Needless to say, it was a very memorable audition in more ways than one! Don't miss Kelsey Connolly in 'The Phantom of the Opera' at Broadway's Majestic Theatre.